QFC was the first store to employ a wine sommelier to special pick the bottles you can find in store. Each store has a vast array of reserve caliber wines and many are housed in special “cellar” rooms overseen by a team of wine stewards. They are on hand to help pick the perfect wine for your needs – be it a special dinner, a night with friends or as a gift. The steward team also goes above and beyond to meet each customer’s needs – if you are looking for a specific bottle and QFC doesn’t have it they will special order it just for you. Tip: make friends with your wine steward! Created as a tribute to his family, Browne Family Vineyards founder Andrew Browne brought together the best vineyards and winemakers in the state to create a line of wines of high quality meant to be enjoyed for both casual and special occasions. The 2012 Tribute Blend is a silky wine comprised of Cabernet Sauvignon, Malbec, Merlot, Cabernet Franc and Petit Verdot. The wine offers bold, big fruit flavors with a lingering finish. From Walla Walla’s fourth founded winery, Waterbrook has a established itself as a pioneer in the Washington wine industry. From everyday values to their reserve wines, Waterbrook Winery represents the Columbia Valley at its best. 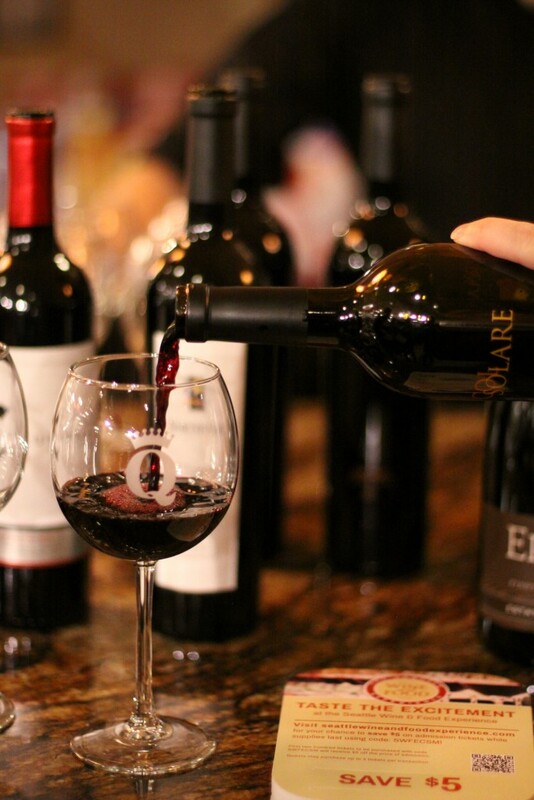 Experience Waterbrook wines in the QFC lounge with their Reserve Cabernet Sauvignon. This is an excellent wine to open up now and enjoy or store it for future enjoyment (it’s going to age beautifully!). Another decades old Walla Walla winery, Canoe Ridge Vineyard was originally formed by a group of Washington farmers, businessmen and winemakers including Gary Bergevin (Bergevin Lane), Norm McKibben (Pepper Bridge), Rick Small (Woodward Canyon), Terry Tucker (Reininger) and Mike Hogue (Hogue Cellars). Now the 181-acre Canoe Ridge Estate vineyard, located in the Horse Heaven Hills AVA, produces some of the state’s best Merlot, Chardonnay and Cabernet Sauvignon grapes. Taste the beauty of this vineyard in the QFC Reserve Lounge with Canoe Ridge’s Reserve Chardonnay. This wine is 100% Chardonnay and is buttery with notes of pineapple and toasted coconut. Tenet Wines is a joint project between Rhône winemakers Michel Gassier and Philippe Cambie and Chateau Ste. Michelle head winemaker Bob Bertheau to raise the profile of Syrah and other Rhône varietals in Washington State. “The Pundit” Syrah has a touch of Grenache, Mourvèdre, 1% Viognier (co-fermented with Syrah) and is a true representation of Rhone-style wines with a hint of the Columbia Valley. You’ll never look at Syrah the same way after tasting “The Pundit”. One of Washington’s newest wineries, INTRINSIC Wine Co. creates true-to-varietal Cabernet Sauvignon from the Columbia Valley. Much like a street artist is a reflection of its urban environment, wine too is a reflection of the vineyard it comes from. This metaphor is displayed beautifully on the graphically inspired art on the label of INTRINSIC. Get a taste of this quick-rising Washington wine star at the Grand Tasting.